The Sony Walkman turns 30 today, amazing as much for the passage of time as it is for the fact that the Walkman brand persists today in digital audio players and cell phones. PC World ranked the Walkman at the top of our 50 Greatest Gadgets of the Past 50 Years list a few years ago. 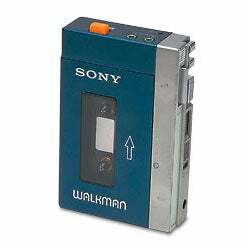 I suspect that even if Apple iPhone had been a contender then, the Walkman would still have come out on top. Thing is, the Walkman encapsulated more than just mobile music. It represented the possibilities of what we could take with us. And how we could capitalize on mashup music. Before the Walkman, magnetic tape recorders in the home were typically relegated to the realm of standalone components the size of TiVo today; or perhaps it was integrated into a boombox, an all-in-one radio and tape device that purported to be portable, but often was anything but portable. When it first came out, the blue-and-silver "TPS-L2" cost $200. And before the Japanese-made English word 'Walkman' took hold, it was originally called the 'Soundabout' in the U.S., "Stowaway" in England, and "Freestyle" in Australia. The TPS-L2 came with a matching blue flip-open case and lightweight headphones that didn't resemble Princess Leia's hair buns (as most headphones of that era did). I remember that first Walkman well -- I was lucky enough to have one. I got mine on a vacation in Hong Kong (where it cost less than US$200 at the time), and I've never been far from a portable music player since. My favorite memories in the beginning involved using that Walkman on long airplane trips, and in car rides to my grandparents. I used to love the orange "hotline" button: I'd press it down, and the playback volume faded into the background -- making it all the easier to eavesdrop on my folks in the front seat of the car, or multitask and answer mom even while still listening to music. That early Walkman also had left and right channel volume controls, and dual headphone inputs -- handy for sharing tunes with a friend en-route to the amusement park. Even though I remember that first Walkman being a bit bulky for one-handed operation, I also recall that its buttons were fairly logically placed, and conducive for operating the device by feel. The TPS-L2 was not my only Walkman; I scored an attractive, curved cassette tape case-sized model in Japan in the mid-‘80s that was slim and super finger-friendly, with all of its buttons in a logical row. What I learned from the TPS-L2, you could say, helped inform the future consumer electronics choices I made. I used the Walkman while studying, while on the schoolbus, to pass the time while working in the basement stacks at the library; later in life, I couldn't survive the L.I.R.R. commute without a Walkman to pass the time. Over the years, I learned to create my own mix tapes starring my favorite artists and tracks. Those tapes, and all of the blanks I consumed to create those tapes, were the precursor to the mix-CDs and iTunes playlists I'd create in the future (both of which required me to consume a different type of media). The original TPS-L2 got my imagination going, too. As a consumer I began to dream that if I could take my music with me in a Walkman, why not my video? (Yes, Sony did produce the Watchman mini-TV, but that was nowhere near the portability I envisioned.) Never mind how huge those early top-loading VCRs were in the ‘80s: I wanted to take my movies with me. It took until the Apple iPod Video made video playback easy and realistic that portable video really gained legs. The TPS-L2 was my first Walkman, but it was certainly not my last -- I probably went through about 10 models over two-plus decades. Some were slim, some had FM and TV tuners, some could record, one was even waterproof. The TPS-L2 was built like a tank, though: It still works. Upon further thought, its last repair a decade and change ago was rather quaint: I had to replace the belts inside, as they'd dried up with age. I remember turning it into a fix-it project with my dad -- yes, just like with old cars, it once was possible for mere humans to exact a repair on an electronic device. While I've long since switched to the joys of digital music, the Sony Walkman is one of the few gadgets I can look back on and trace how it changed my behavior and interaction with an electronic device. And of the others, even fewer stand out by name like the Walkman does. This story, "Sony Walkman Turns 30: Memories of an Iconic Gadget" was originally published by PCWorld.